Starring: Bill Hader, Anna Faris, James Caan, Will Forte, Andy Samberg, Benjamin Bratt, Neil Patrick Harris, Terry Crews, Kristen Schaal, Cody Cameron, and more. 1) Voice Acting - Total Thumbs Up: All the beloved characters and most of the original voice actors are back in this sequel to the 2009 film. Bill Hader as the naive yet well meaning Flint carried us through the eager scientist's travails. Anna Faris was perky and still a force to be reckoned with. Neal Patrick Harris is way too much fun as Steve. Benjamin Bratt delivers all of Manny's great one liners with aplomb and to great effect. Will Forte moves from his smaller role in the first film to the main villain of the piece as Chester V - a great choice as he gives Chester just the right touch of believability and guile. 2) Artwork/Animation - Total Thumbs Up: The artwork and animation department of Sony Pictures Animation did an outstanding job with this film. The mainland, the HQ for LIVE, and the drastically altered island of Chewandswallow were amazing places to behold. LIVE was slick. All the tech was slick. Even the company helicopter blades had a flare all their own. The actual working environment was an ordered sea of stale cubicles, while the elite worked on their science way above the others. With Flint's 'seat of the pants' science, the two appear almost polar opposites. The island in turn was like stepping into an alien world. A familiar place changed and turned stranger because of the familiarity. The concept of the foodimals made for amazing visuals. It took common things we've seen all our lives, yet now displayed them in a totally new way to make something fresh and different. I think my favorites were the owls. Though the cheesespiders were a close second. The cucumber people were too cute. I also loved the primeval yet technological look of the FLDSMDFR's resting area. It had a great emotional feel to it - science and nature joined together. 3) Story - Thumbs Up: Lately, there's been a weird trend to make the protagonist's hero into the bad guy of the story. I've seen it at least three times in animated films this year. It's a little worrying that everyone keeps telling children that all their hero's are bad. New elements in the sequel included showing healthy interpersonal relationships versus those that are one sided. And not just those the second person clings to because they don't truly realize the real state of the relationship, but also those they have with themselves. The ying and yang of Flint and Sam is also reflected on. Flint might be a genius, but it is Sam who is wise. 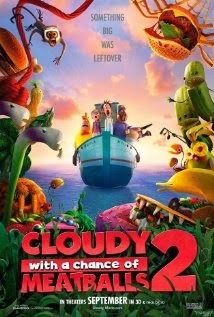 Conclusion: "Cloudy With a Chance of Meatballs 2" is a fun, visual feast. The kids will have plenty to keep them entertained, dazzled by the awesome imagination of the animators and writers. For the adults, there are a ton of jokes, which mixed visuals with wordplay - a few are even quite nostalgic. Make sure to sit through most of the credits - the animators had a little fun with different styles there on some of the added bits.